U kan nog tot donderdagmiddag, 30-08-2012, voor de PCB Visualizer van Eurocircuits stemmen! Tijdens de week van 25-28 september is het weer zo ver en kan u ons vinden op HET Instrument 2012, in Amsterdam, Hal 1 stand B031. Deze beurseditie hebben we besloten mee te dingen naar de nominatie: “Noviteit 2012 van de branche Industriële Electronica (IE)”. Hiervoor hebben we onze nieuwste ontwikkeling “PCB Visualizer” als noviteit ingediend. Waarom geloven wij dat PCB Visualizer een noviteit is? PCB Visualizer, analyseert uw PCB data en vergelijkt deze met uw order data en toont uw print online op het scherm. De analyse gebeurt met dezelfde technische software en regels die wij intern gebruiken om uw print productieklaar te maken. Zo geeft de analyse, ook al loopt deze volledig automatisch, een realistisch beeld van mogelijke onduidelijkheden met uw order. Bovendien, en dat is wellicht meteen ook de grootste troef, gebeurt dit alles nog voor u de bestelling doorstuurt. U kan dus zelf, op voorhand, mogelijke anomaliën voorkomen. Bovendien staat PCB Visualizer in uw Eurocircuits klantaccount 24/24 en 7/7 ter beschikking zodat hij voor u werkt wanneer u dat wil. PCB Visualizer is een Eurocircuits software onwikkeling die technische CAM software en onze e-business software met elkaar integreert. Wil u meer weten over PCB Visualizer, lees dan onze BLOG over PCB Visualizer of ga direct naar de stempagina op de site van Het Instrument. Daar vindt u eveneens meer info en kan u direct uw stem uitbrengen. Stemmen kan tot donderdagnamiddag. Wij rekenen op u! Vergeet niet te registreren voor een gratis toegangsbewijs voor de beurs. Dat kan u hier meteen doen. Op deze manier steunt u ons ook voor de ranking in de marketing cup! Dank bij voorbaat. Gadget. Terwijl u registreert kan u zich eveneens aanmelden voor het Gadget 2012, de “compass clock“. 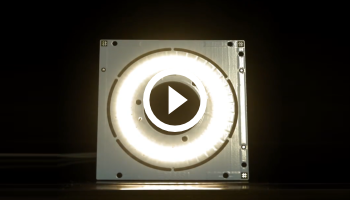 De compass clock,is ontworpen door YMIF engineering en de printen komen van Eurocircuits. Zeker doen! Meer over hoe te registreren en over het aanmelden voor het gadget, vindt u in onze BLOG over HET Instrument 2012. Verder willen wij u nog attent maken op het beursseminarie: “Design Automation & Embedded Systems” dat plaats vindt vrijdagochtend 28 september, zaal G104. 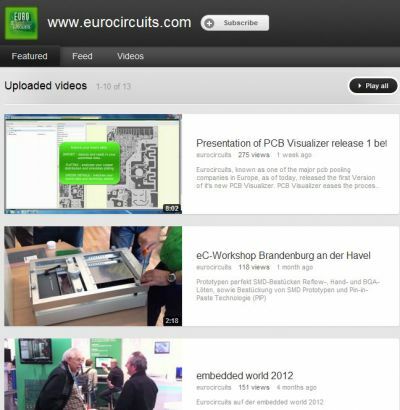 Eurocircuits zal er een presentatie geven over “Eurocircuits goes visual” waar PCB Visualizer een wezenlijk deel van uitmaakt. Wij kijken er naar uit u in Amsterdam te ontmoeten en hopen dat u voor ons STEMT en via ons REGISTREERT. 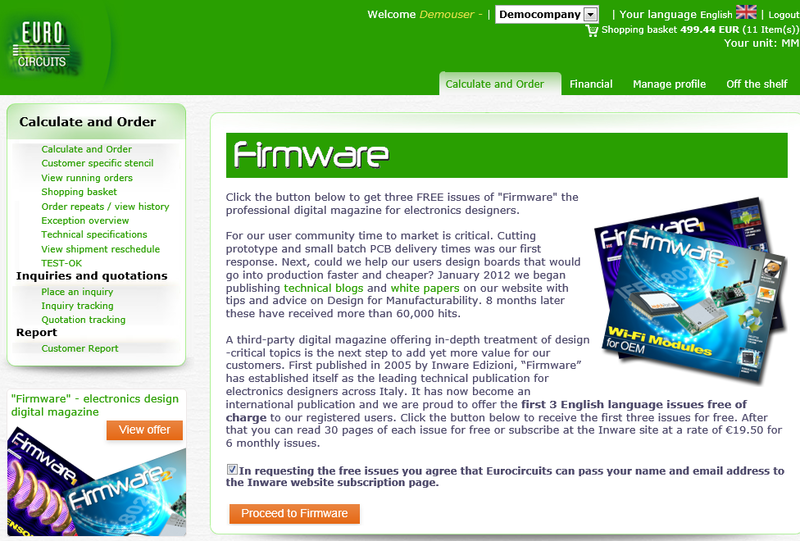 Subscribe to “Firmware” electronics design digital magazine through your Eurocircuits account. 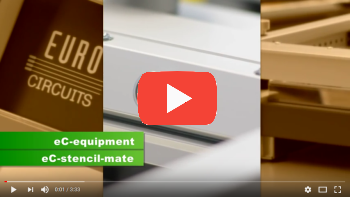 As specialist prototype and small batch PCB manufacturers, we see our role as more than just making PCBs. Our goal is “added-value service”. We recognise that time-to-market is critical for our user-community. That is why in 2011 we cut our base-line delivery for small batches (anything under 50 dm2 from 10 working days to 7. But faster fabrication is only part of the story. Were there, we asked ourselves, other areas where we could help to speed time to market? We set up a direct link with EAGLE CAD so that designers could get prices and place orders in seconds without manual data entry and without leaving their CAD PC. We developed PCB Visualizer so that they could check their data the minute it was uploaded. We launched our bench-top stencil-printer and reflow oven which can cut in-house assembly times by 80% compared to manual assembly. These steps can make a measurable quantitative difference, but what about a qualitative difference: could we help designers design boards that would get into production quicker and were easier, faster and cheaper to make? In January 2012 we stepped up the publication of technical blogs and white papers on our website. These deliver tips and advice on Design for Manufacturability and how to present clear, unambiguous and accurate production data. Within 8 months they had received more than 60,000 hits. 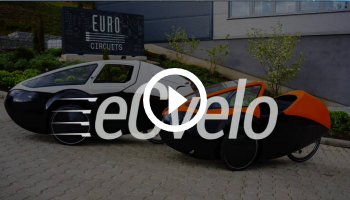 We backed these with DRC templates for EAGLE and Altium so that designers could be confident that their designs would meet the requirements of the most cost-effective pooling service. A third-party digital magazine offering in-depth treatment of design-critical topics is the next step to add yet more value for our customers. We looked for a journal with genuine technical content rather than continuous sales-oriented press releases. “Firmware” was our first choice. First published in 2005 by Inware Edizioni, “Firmware” has established itself as the leading technical publication for electronics designers across Italy. It is now being launched as an international publication and have arranged that our registered users can get the first 3 English language issues free of charge. To access your free issues, log in to your account and click on the new “Firmware” tile on the left of the screen. If you are not a registered user, click on the “Firmware” link here to get free access to 30 pages of each issue or to link to the Inware website and take out a subscription. At Eurocircuits we are already well-known for our powerful offer manufacturing prototype and small batch PCBs for electronics engineers. We have already extended this back into the design process with our links to EAGLE and to Altium. But what about assembly? We are often asked if we can assemble boards and several of our competitors offer this service. The following diagram illustrates powerfully why we should not. Prototype and small batch assembly requires a heavy investment in equipment and expertise. So it has a high cost of service. On the other hand, customers are driven by price. The value of the service is perceived solely in price terms, cutting prices and lowering margins. The pure prototype assembler risks getting caught in the mouse-trap where low prices mean that he can no longer cover the cost of his service. Two ways of increasing margins have emerged over over the last few years. Some assembly companies have stayed with small batch assembly but moved into very high technology markets like defence, aviation, medical or high-end communications. Others have moved into high-volume assembly, only making prototypes as a loss leader to land large contracts. 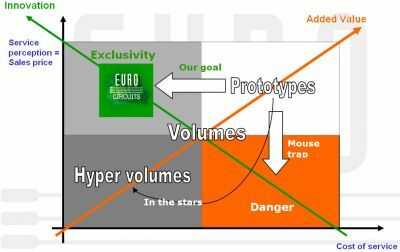 At Eurocircuits we have evolved our business model to handle medium technology prototype and small batch PCBs quickly, reliably and cost-effectively. We are not in the very high technology market nor are we volume producers. So offering a “me too” prototype assembly service would not work. And in any case it doesn’t make business sense to compete with our customers.